The moment I saw the motto of “The Great Rapscott School for Girls of Busy Parents,” I knew I’d love this children’s book: “Adventure is worthwhile in itself” (Amelia Earhart). From the start, we are launched into a very unusual, wacky world with a thoughtful story of five girls who wind up at Ms. Rapscott’s school. Of course, just the idea that it is a school of girls of busy parents already puts us on notice that things are done in jest. And yet, in it’s own way, the children’s book illuminates all the ways children go astray without guidance from loving attention. We can recognize ourselves and others in each of the characters. There’s not a lot of character development in this quick moving children’s book. Rather, we simply watch the activities move by, and wonder where the story is going. 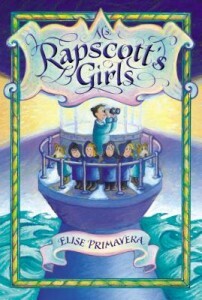 From that point of view, Ms. Rapscott’s Girls can just be read as a fun adventure story. And yet, at the end, the profound lesson of resilience is brought home quite directly. It leaves us pondering how the girls will put the lessons into practice when they return to their busy parents. Aside from the satire and social commentary about parenting, Ms. Rapscott’s Girls is more about taking chances, and believing in one’s own power to succeed. It is about pluck, as it says in the opening, the willingness to persevere. What child doesn’t need to be reminded of that? I liked this book, and hope for more in the same vein. The illustrations, by the way, are beautifully done, and very much in the style of Hugo Cabret.